Dear Scotch Whisky I have not forgotten you but please forgive me for what I am about to say. Well I am really looking forward to this summer when it arrives. 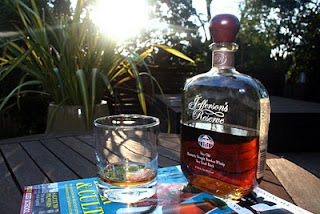 Bring on some balmy nights, a slow sunset, barbecue sizzling in the background and a few neat bourbons to go. I have been holding off on drinking too much of my Jefferson's Reserve just for this reason and the time is nigh. In saying that, I think it is time though to post my review and comments on my bottle of Jefferson's Reserve. I heard about Jefferson's Reserve on WhiskyCast many months back. With a certain limit on what bourbons are available in Australia, I was keen with excitement when I found this bottle at a local specialist liquor shop. I had a choice between the Jefferson's (standard) or the Reserve. It would be good at some stage to try the standard but at the price one needs to pay for these whiskies that is going to be a long time coming. Jefferson's is a Mclain & Kyne product owned by Castle Brands in the US. Not really much support on the website about the product and the tasting notes are limited (similar to most bourbon distillers I have found). I am not sure if it is the norm in the US to not go into detail about whisky or if people just don't want to know about it...but it does get frustrating in comparison to learning about Scotch whisky. This is why I tend to only buy bourbon on recommendation from trusted sources (especially when a bottle costs A$130). Truly this is what you class as a gentleman's whisky. Sip it, enjoy it, pour some more. You know it is expensive and your not drinking it because of that fact. To nose is shear enjoyment. Sweet corn, slight oakiness with hints of dry straw and dried sweet fruits and sultanas. To taste it is full bodied, unexpectedly soft, dry yet sweet. The spiciness and slight bitterness arrives ever so slowly with tingles on the middle of the tongue. The finish turns to citrus, is easy and none offensive. Very warming in the chest with a return bitterness on the sides of the tongue. Out of 7 I would give it a 6. I am still looking for something more in a bourbon but it is like the rules for a Straight Kentucky Bourbon is so strict it is hard for a distiller to find that unique edge (or maybe they just don't want to for traditions sake). One always has to remember the limited release of bourbons in Australia so maybe those unique styles just have not made it here yet. Was it worth the cost? No I do not think so, bring it back to A$60 and I might agree. Like many bourbons, though I like it, the saturation of corn really does overpower many other flavours which makes it hard to find heavy complexity. I would love to try a bourbon mash that is aged somewhere else like scotland just to see how the environment influences the taste (i.e. none of the extreme humidity and temp fluctuations). Other note is that The Secretary and myself also opened a bottle of Buffalo Trace to taste and compare at the same time. Very tasty though at A$60 it is getting up there for a bourbon. I am sure we will be seeing this review some stage in the future. None the less I sit back and finish off this glass until tomorrow afternoon.